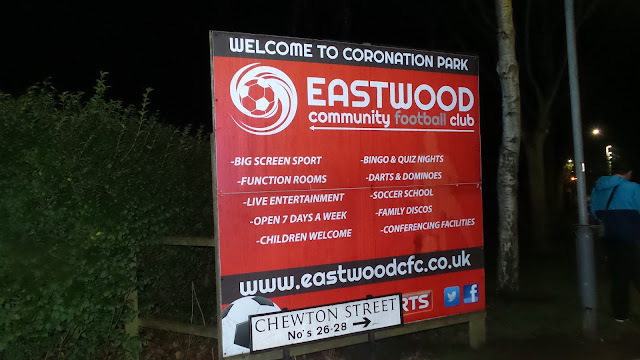 EASTWOOD TOWN were formed in the Queen's Coronation year of 1953, and it was from this fact that they named their ground Coronation Park. After starting out in local leagues such as the Notts Alliance, they would join the Midland League in 1971. After bottom half finishes in their first few seasons Eastwood were never out of the top six for the remainder of their time here, becoming champions in 1976. They left to become founder members of the Northern Counties East League in 1982, staying here for 5 years. 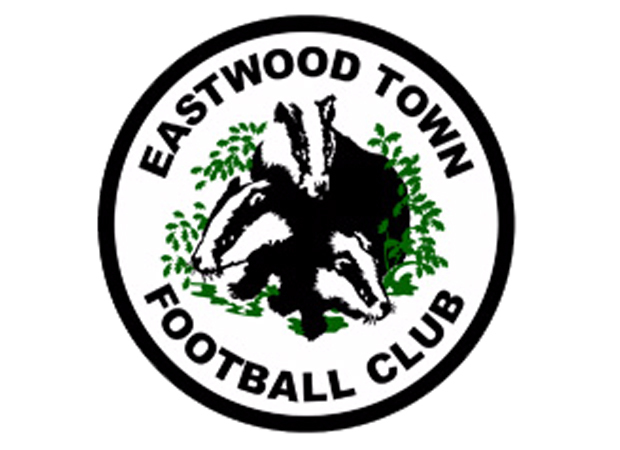 1987 saw the NPL expand, and Eastwood Town would benefit, joining the newly formed Division 1. 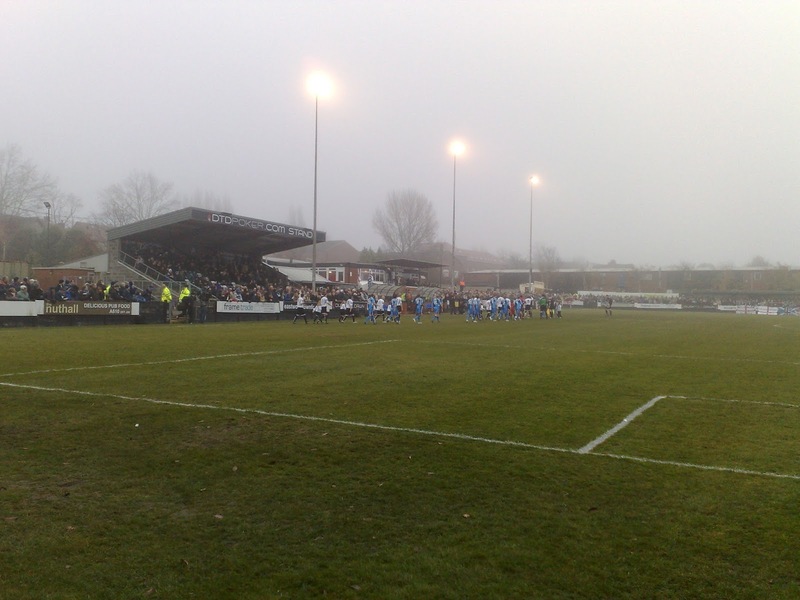 Apart from 2003/04 when they returned to the NCEL Premier following relegation, they would remain here until 2007 when they won promotion to the NPL Premier. A couple of seasons were spent here before they were crowned champions in 2009. Promotion to the Conference North followed and 2011/12 saw their best ever season, finishing 4th. However, due to their ground being adjudged to be not up to scratch, they were not allowed to participate in the end of season playoffs. As a result, backers lost interest, and a period of financial turbulence followed. The club's final two full seasons saw rock bottom finishes and subsequent relegations. 2013/14 saw them in the NPL D1 South and the club folded midway through the season, having their record expunged. Eastwood Town's run to the FA Cup 3rd Round is detailed below. They only spent a single season in the FA Vase, but 2003/04 was a decent one, with them taking Colne to a replay before exiting at the Quarter Final stage. The following season saw a heroic FA Trophy run to the 5th Round. 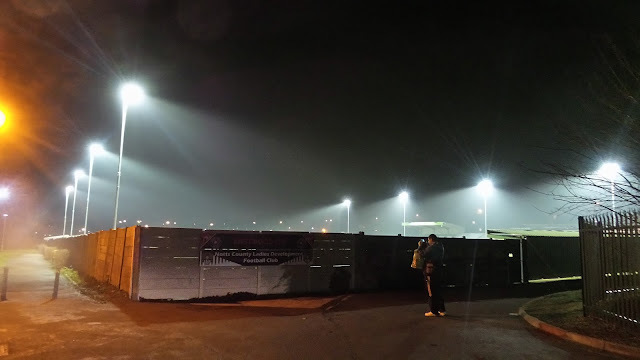 Worksop Town, Bridlington Town, Spennymoor United amd Hayes were beaten before they faced Hereford United, After gaining a 1-1 draw at home, they finally bowed out 4-2 in a replay. There has been plenty of success in local cups - the Notts Senior Cup has been won on 12 occasions and the Ripley Hospital Cup has been lifyed 6 times. Other honours include the Evans Halshaw Floodlit Cup, the NPL Challenge Cup, the Notts Alliance League Cup, the NCEL Presidents Cup and the Midland Alliance Cup. 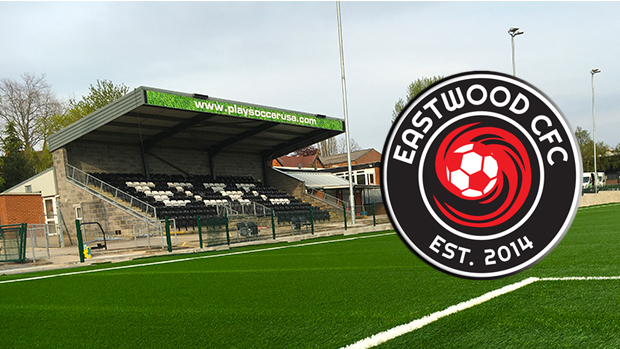 Following the demise of the original club, a new team EASTWOOD COMMUNITY were set up. They started the 2014/15 season in the Central Midlands League South. They've not really progressed as well as expected with 13th and 10th placed finishes, but at least the town once again has a football team representing it. This season has seen a huge improvement, sitting in 2nd place at the time of my second visit and with a real good chance of rising to the summit if they won their games in hand. Yet to enter the FA Cup, Eastwood Community are also awaiting their first FA Vase win, with defeats in their two outings so far. I'd be watching the under 21 side, and they were not doing so great, sitting bottom of their league, but with plenty of scope to improve their lot should results pick up. Initially, I had visited Eastwood's Coronation Park to take photos on way to a game at Mansfield with fellow Wycombe fans Sue & Paul. The club had been really friendly and showed us around the ground. They also mentioned that Wycombe had been there just half an hour previously, using the pitch to train before the game. 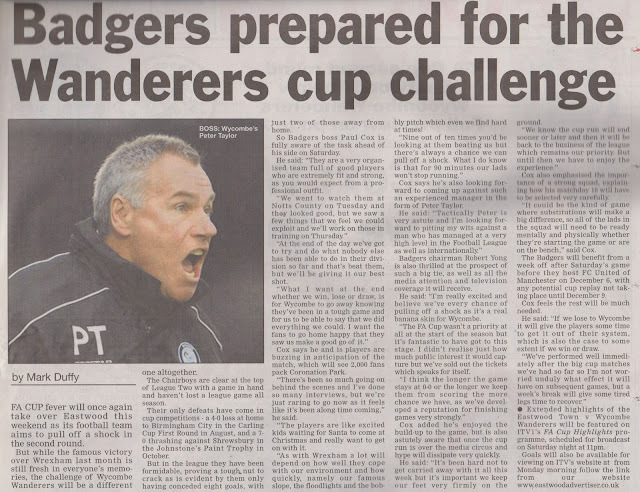 Fast forward a few years later and Wycombe would be travelling there for 2nd Round FA Cup game, having beaten AFC Wimbledon 4-1 in the previous round. 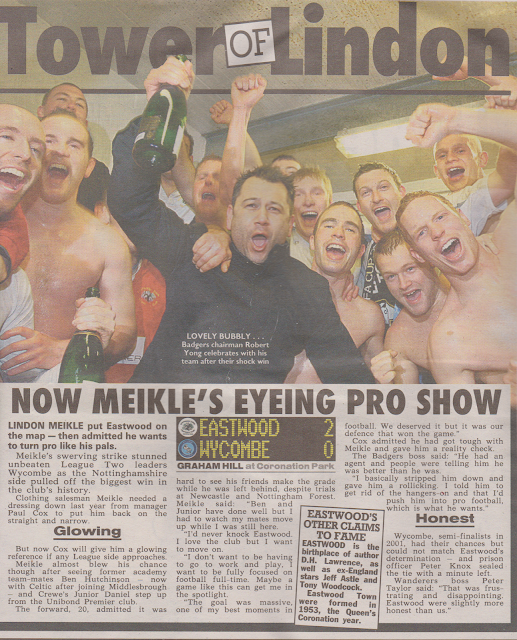 This game was in the midst of Eastwood Town's best ever FA Cup run. 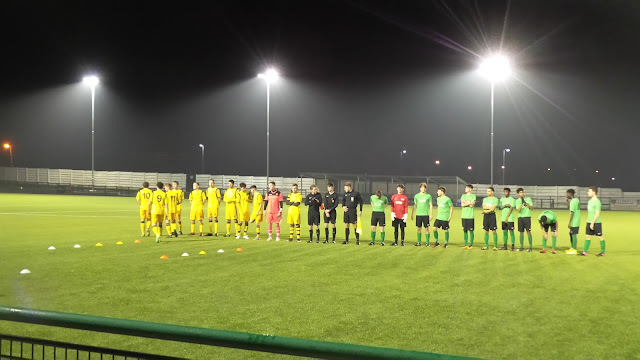 They started was back in the 1st Qualifying Round with a home game against Kidsgrove Athletic. Marc Smith and Ross Gardner grabbed a brace each in a 4-0 win. The following round saw a trip to Lincoln United, where a Chris Shaw goal was enough to secure a 1-0 win. The 3rd Qualifying Round saw their first giant-killing. They shared a 2-2 home draw with Conference North side Harrogate Town - Mark Hume and Paul Robinson getting the goals. They faced a tough trip to Yorkshire for the replay but goals from Richard Dunning and Ian Holmes saw them win 2-0. An even bigger scalp followed in the final qualifying round. Wrexham had only just been relegated from the football league, but Eastwood claimed a goalless draw in North Wales. They followed this up with a 2-0 win on home turf, this time Andy Todd and Ian Holmes grabbed the goals to take them through to the 1st Round. Here they met Southern League side Brackley Town and goals from Lindon Meikle and Simon Sturdy saw them win 2-1. 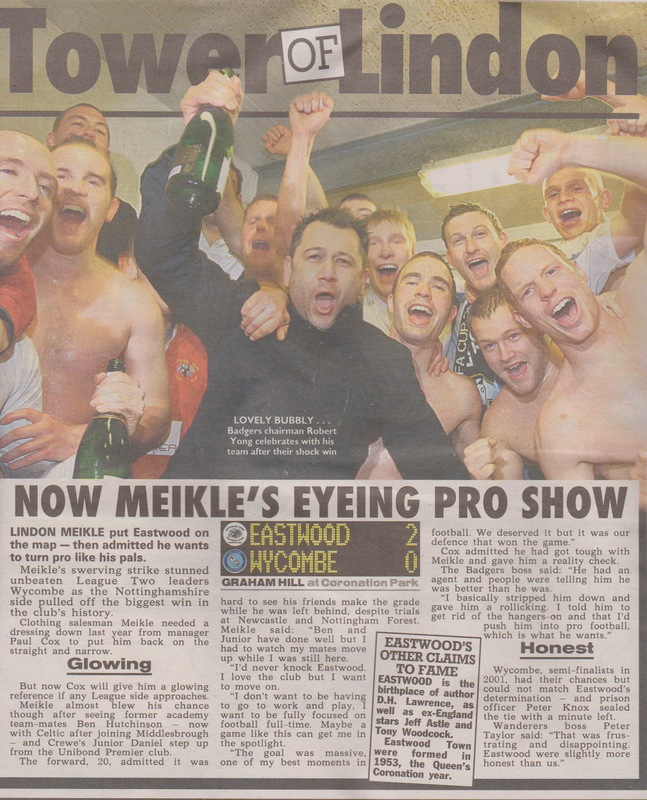 After beating Wycombe Eastwood were hoping for a big fish in the 3rd Round. However, they faced a trip to fellow non-leaguers Kettering Town where they lost 2-1 to end what had been a remarkable run. On the day of the game, I decided to take the supporters coach for a change, as parking could be a bit of a problem for such a big game. We got there without any problems and I went for lunch in a local chippy, having battered burger, curry sauce and chips before going to the pub for a pint. 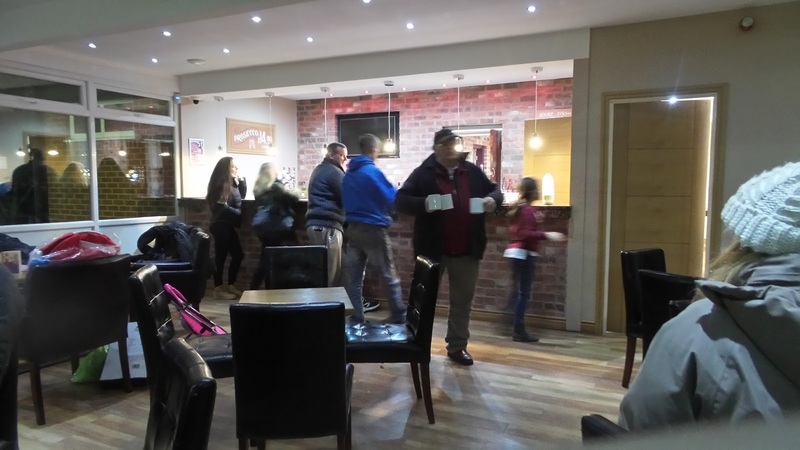 It was a bit dicey in some of the pubs, as some of Nottingham Forest's more unsavoury fans had come to support Eastwood and were out looking for trouble. I went into the ground. I bought a programme and a special match scarf, on what I thought would be a winnable cup tie. 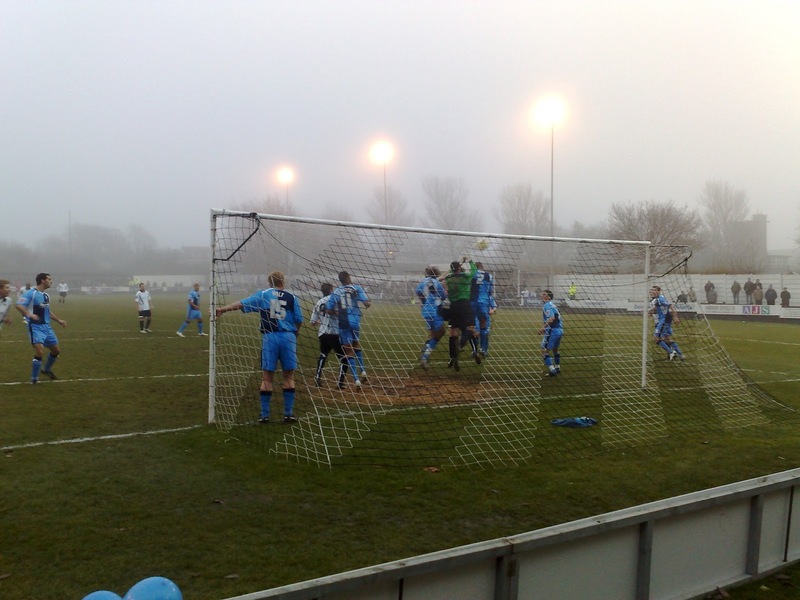 How wrong I was, Wycombe were abysmal, hardly had a kick in a game played in gloomy fog. 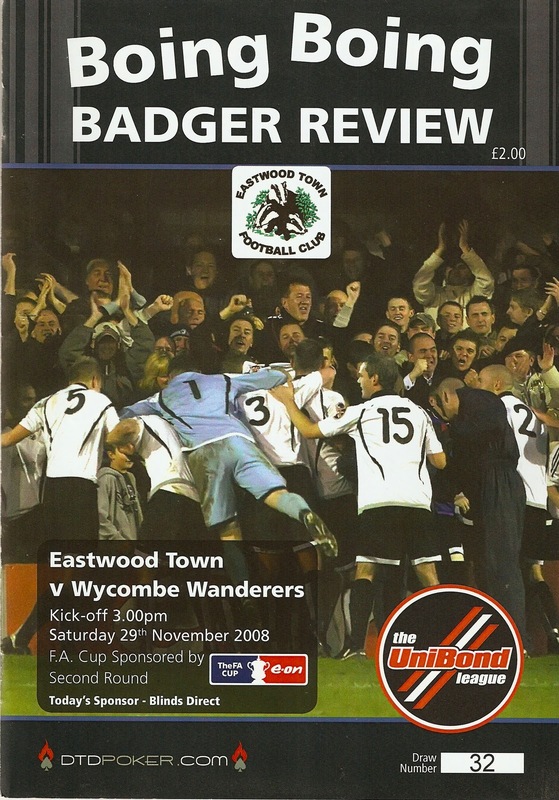 Eastwood were full value for their win, and progressed to the 3rd Round at the expense of Wycombe. The match report from the game is below. I'd been fancying a revisit to Eastwood for a while as I'd not really done my visit justice on my blog. Also, the town looked very decent for pubs, with a Wetherspoons and a decent looking micro pub, with the latter hopefully doing takeout. 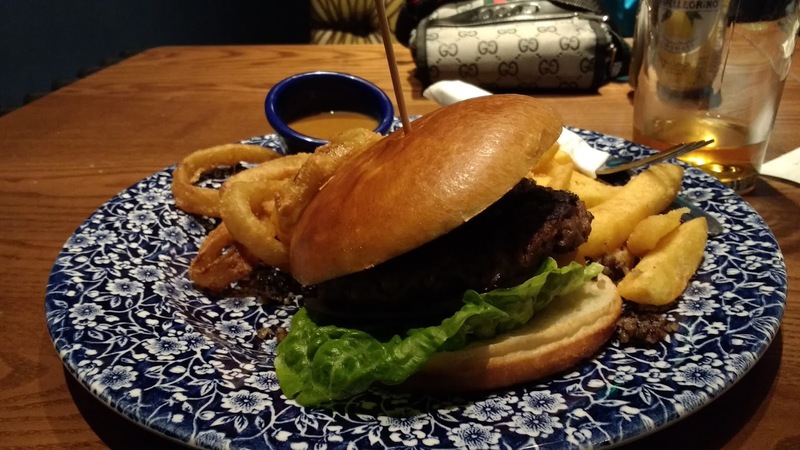 It was also Burns Week at Wetherspoons and with me wanting to try the Haggis Burger, I only had a very limited timescale in which to do so. 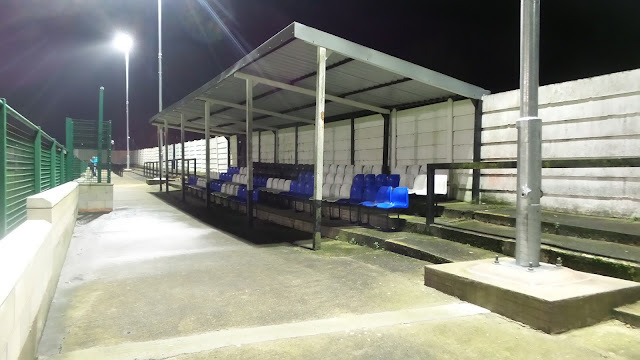 Friday nights are my favourite night for football, but the opportunities are sparse during the winter months. Thankfully, a local blog called 'On The Road' helped me find this clash. It would only be an under 21 game, but it was better than nothing. Also, with a recently installed 3G pitch, there would be no issues with the weather interrupting things. Fellow hopper Anwar had wanted to go to Eastwood for a while, and expressed interest when we talked about it on Tuesday night. I text him on Thursday and got an almost instant reply. Normally this means he isn't available, but on this occasion, he gave the thumbs up. I was delighted, it had been a crap week at work, and as well as the help with fuel costs, football is always better with company to help the travelling go quicker. On the day of the game, I overslept, getting to work half an hour late. The day wasn't as bad as expected and I was finished at 1.30. After going home and having lunch, I caught up with various other bits and pieces. Leaving at 3.30, I met Anwar in Aylesbury at 4 and we were soon on our way. It took a while to get out of the town what with the rush hour traffic, and then there were more delays, with us getting to Eastwood at 6.40 after 40 minutes of delays. I'd already planned to have dinner in the local Wetherspoons, The Lady Chatterley. There I had a Highland Burger with all the trimmings and a pint of my favourite Black Dragon cider. Both were decent and filled me up as we walked back to the ground. Arriving back at 7.30, we were pleased to find that entry was free, though I couldn't find any team info. A few things had changed since my last visit. For one there was the 3G pitch and a higher fence around the pitch. Secondly, seats had been put in the small stand on the far side. We stood to the side of this in the first half and were expecting a competitive game. That proved to be the case in the opening period at least with Belper going ahead just before half-time when their number 11 latched on to a good through ball and finished well. It was what they deserved for dominating the game so far, and in the second half they would turn their possession into goals. Number 11 got his second when he finished from 15 yards after a square ball across the box on 52 minutes. It was 3-0 just after the hour mark when a shot was drilled home low and hard from the edge of the area following a good cutback from the left. This prompted a goals avalanche and soon after it was 4-0 as number 9 finished when a curling cross was put in from the right. Belper made it 5 when they netted a rebound in their most productive period of the game with 3 goals coming in a very short space of time. The game had to wait until six minutes from time for the Nailers to put the final nail in the coffin. This time the striker showed good strength to hold off his opponent and finish from inside the area. Either side of this last goal Eastwood had a couple cleared off of the line, but they were very poor overall. Their bright spot was their left winger, number 11 who got up and down the pitch well and showed good strength, but sadly the rest of his teammates appeared to lack confidence. It had been a nice ground to revisit, but I'd have liked a more competitive game. It was time to head for home, but not before I walked up to the excellent Tap and Growler where I had a choice of 8 real ciders to real from. I opted for a couple of pints of Sheppy's Orchard Dew to take out before I got on my way. The journey home was pretty similar to Tuesday with the closure on the M1 meaning that I took the A5 back down to Milton Keynes. The only difference was that the other drivers were a lot slower tonight, which was frustrating on the single carriageways. I dropped Anwar off at midnight, getting home myself 20 minutes later. I enjoyed my cider whilst watching Coronation Street and various Youtube videos, going to sleep around 2 am. CORONATION PARK is a smart non-league ground which due to them finding home at step 7, is as good as any ground in their league. The main stand holds around 400 and looks pretty modern. It is elevated quite high and there are no supporting pillars, so you should have a good view. 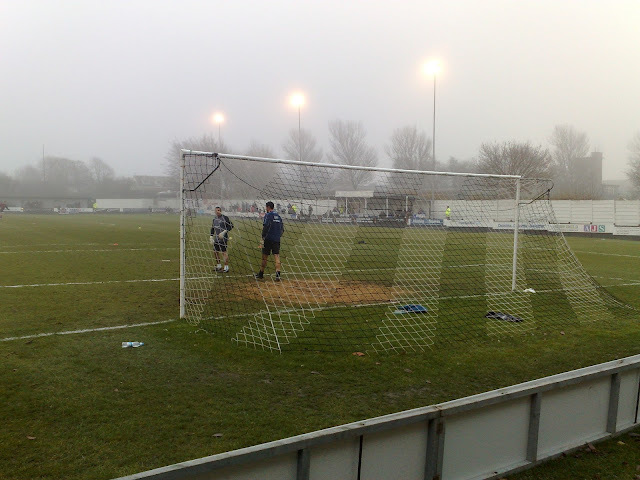 Behind both goals is fully covered, whilst there are two smaller areas of cover, one on each side. The ground has an overall capacity of 5000, of which around 2000 is covered. 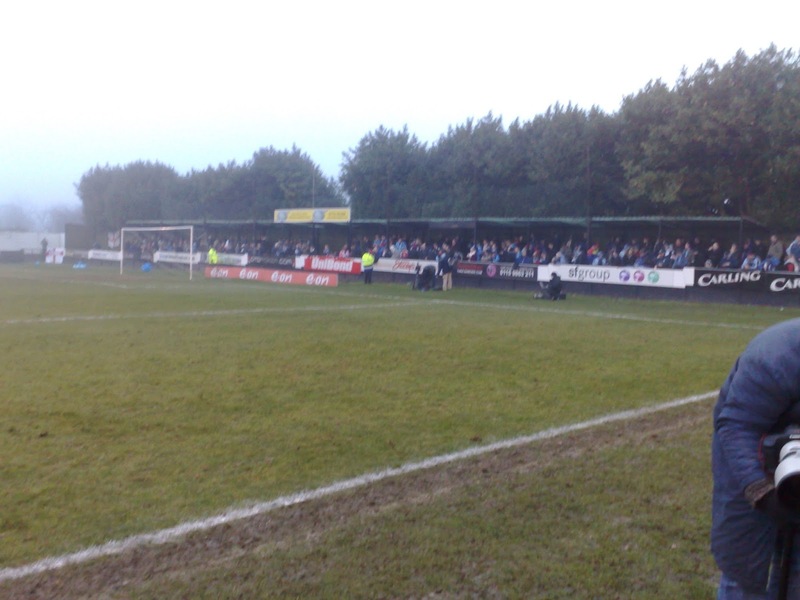 If segregated, visiting fans are allocated behind one goal at the Plumptre Way end. I can't recall any details about the club shop, clubhouse or tea bar from my first visit, although upon researching my subsequent visit I found that the town has a few decent pubs. the Lady Chatterley Wetherspoons and the Tap and Growler Micropub were of particular interest me, with the latter purported to have 6 real ciders and many more real ales on offer. 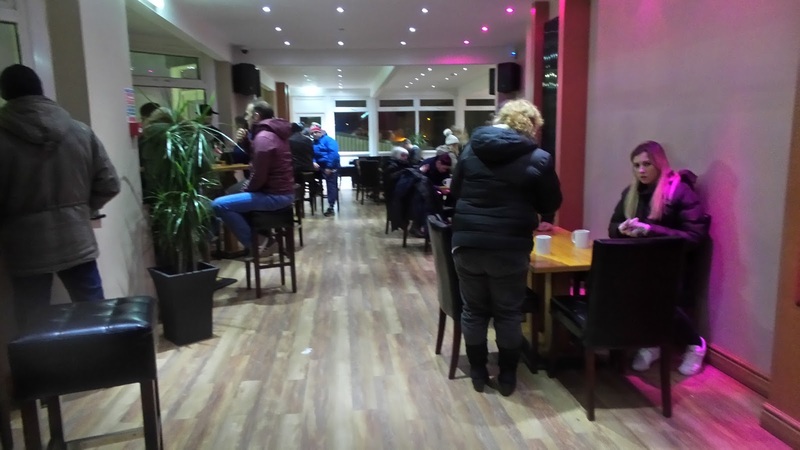 The bar at the ground is pretty nice, though not the greatest range of drinks, nor is there much Eastwood related stuff on display.